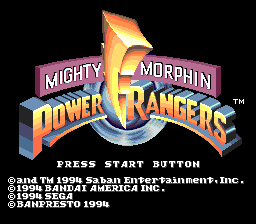 Mighty Morphin Power Rangers for the Sega Mega Drive is a versus fighting game based on the TV show with the same name. In North America, two cover variants exist. The rarer of the two, which depicts the Rangers at a construction site, commands high prices second hand. Despite being a late release and using a 16 Megabit ROM, the game has average at best graphics and music. A lot of the ROM was likely used for cutscene pictures and voice samples. The game utilizes a simple 2 button control scheme, one for light attacks and one for strong attacks. Special attacks are character specific and performed with genre typical inputs (quarter circle motion, charge attacks etc.). Guarding is performed by holding baclkwards. There are no default throws. Fights have only one round. Each enemy is fought twice, once human sized, and once in "grown" shape. To challenge the grown opponent, the character uses the "Megazord" or "Dragonzord". The final boss can only be fought with the aforementioned robots, and needs to be defeated twice. In a genre untypical manner, characters can be changed between each enemy. © 1994 Bandai America Inc.
Main article: Mighty Morphin Power Rangers (Mega Drive)/Magazine articles.